We only use extremely high quality, vitamin-rich, certified organic, cold/expeller pressed, unadulterated butters and oils. Cocoa butter is an oily substance that’s extracted from cocoa beans – the same cocoa beans that are used to make chocolate! Shea butter - has amazing moisturizing properties, Shea butter aids in the skin’s natural collagen production and contains oleic, stearic, palmitic and linolenic acids that protect and nourish the skin to prevent drying. Cocoa butter - Cocoa butter makes an excellent skin moisturizer, plus it does more than just hydrate the skin — it helps actually heal it from the inside out too. It’s a great source of natural antioxidants that are found in cocoa beans. Saturated fats are especially beneficial for healing dry, cracked skin because they’re easily absorbed and remain on the skin for hours. 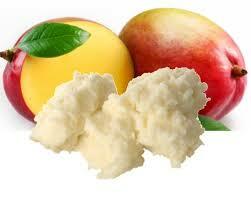 Mango butter - Mango butter is rich on oleic acid and stearic acid. These fatty acids acts as emollients that soften and soothe the skin and hair. It has a high oxidative ability, wound healing and regenerative activity. It is high in antioxidants and Vitamins A, C and E.
Almond oil - the oil is rich in Vitamin E, monounsaturated fatty acids, proteins, potassium and zinc, besides a number of other minerals and vitamins, which explains why it is so good for skin and hair. Grapeseed oil - assists in skin repair and offers antiseptic as well as mildly astringent properties. Castor oil - being highly viscous, the oil stays put, and penetrates deep into the skin tissue and nourishes it with fatty acids. Shea butter comes from the seeds of the fruit of the Shea (Karite) tree and that is naturally rich in vitamins A, E and F.
Vitamin E oil - reduces dryness and flakiness. Zinc oxide - protects against UVA and UVB light rays and is often used as a natural, non-toxic sunscreen to prevent burns, signs of photo-aging and irritation. Beeswax - provides a protection against irritants while still allowing the skin to breathe. It also offers anti-inflammatory, antibacterial and antiviral benefits making it helpful in treating skin irritation. Essential oils - we use a variety of essential oils. For example, we use lavender oil as it helps with skin irritation & also helps keep your piggy calm.